If your music demands crystal clear notes and fluid, dextrous picking, get yourself a pack of Primetone™ Sculpted Plectra. Made with Ultex® for superior tonal definition and durability, each pick is burnished by hand so that its sculpted edges glide smoothly off your strings like a broken-in pick. We developed these picks to have the elusive sound of tortoiseshell, and this is the closest we’ve ever gotten. Because tortoiseshell was infamous for being slippery, we gave every Primetone pick a grip with enough traction to give plenty of control but low-profile enough so you can still shift it easily in your hand. If you prefer a smooth surface, all models except the Jazz III are available in non-grip form, which have also been designed to have a slightly warmer tone. The beveled edges were inspired by guitar players’ high mileage celluloid picks, whose edges have been worn into a natural “sweet spot” bevel that makes playing practically effortless. Some players even go as far as using emery board or sandpaper on their picks to get the same effect. We decided to save you all that time and effort and just sculpt that sweet spot right onto the pick so you have it straight out of the package. Each pick’s edges are hand-burnished to further break them in and then inspected by one of our pick technicians. 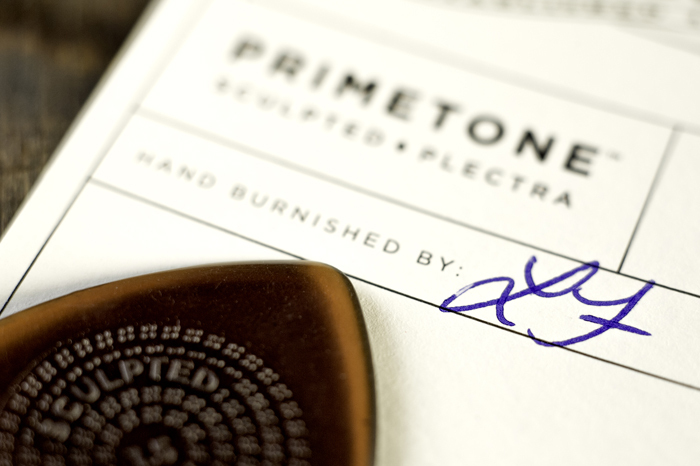 We asked a handful of Primetone Sculpted Plectra players a couple of questions about why they’ve made the switch. Here’s what they had to say. How does the Primetone Sculpted Plectra affect your technique and the way you play? Tosin Abasi (Animals as Leaders; AAL Jazz III XL Grip): It’s really the perfect combination of material, shape and dimension. The beveled edges make picking feel fluid and unobstructed. Zach Blair (Rise Against; Triangle Grip): I play hard, so I need a pick I can depend on not to break or wear down. I know that Primetone picks will stand up to everything I put them through. Scott Fore (Former National Flatpicking Champion; Small Tri Grip and Smooth, Standard Grip and Smooth): The grip and bevel allow me to greatly vary my tone with subtle changes in the pick angle, and the beveled edge allows a greater string to pick contact area, which gives a much fuller tone. The grip surface prevents the pick from unwanted movement, but I also like the non-grip picks. Their darker tone allows for a big, fat, clear tone on even the brightest of guitars. Perfect picks for all styles of playing. The Ultex material doesn’t get scratchy or noisy from wear, which is another great benefit. Jude Gold (Jefferson Starship; Editor, Guitar Player; Standard Grip): They have the classic vibe of celluloid picks, but they don’t break and they don’t slip or get sweaty, especially with that center grip. The beveled edges give you a bit of that comfortable, broken-in feel, and I love that. A broken-in pick has songs in it. How do Primetone Picks open up your tonal possibilities? Tosin Abasi: When the pick glides off the string, it produces a beautifully full and articulate tone. You can hear it even when the guitar isn’t plugged in. Zach Blair: I’ve come to expect a certain tone out of the Primetone pick, one that’s dark and well rounded. It’s affected my playing and overall style immensely. Scott Fore: The Primetone picks offer the best tonal possibilities of all pick materials available, even the revered tortoise picks. They sound full and clear, producing an open, balanced tone from the lowest note to the highest note. 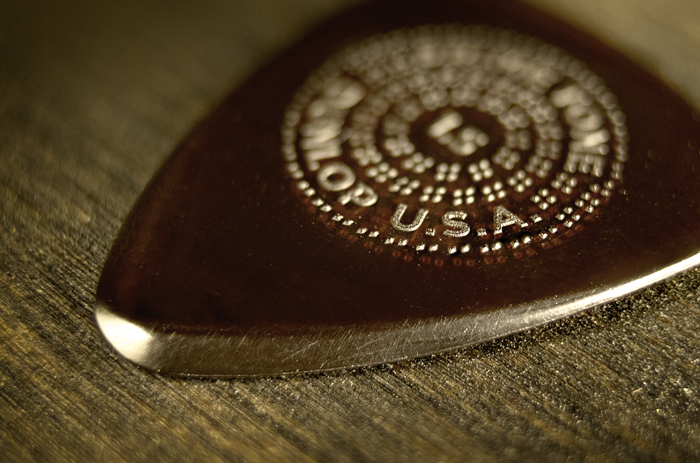 With a beveled edge, the tried and true Standard shape gets the smooth, quick release of a well-worn pick. The standard’s shoulders are also beveled for players who like to turn their pick around for a different sound. The Triangle shape gives you three beveled edges and a wider gripping surface for greater control. Great for bass players. The Small Tri is a shape that’s been gaining in popularity. Like the Primetone Triangle, the Primetone Small Tri features three beveled edges, but its smaller profile really lets you choke up and dig in with greater control. The quick-release Primetone edge enhances the Jazz III’s famous control, speed, and precision. Only available with the low-profile Primetone grip. Get the Jazz III XL shape’s tight maneuverability and laser-guided, lightning-fast tip with the hand-burnished beveled edges and flexible, snappy attack of Primetone Sculpted Plectra. The warm and mellow sounding Semi-Round shape features three beveled edges and two different playing tips so you can easily change up your attack and your sound. 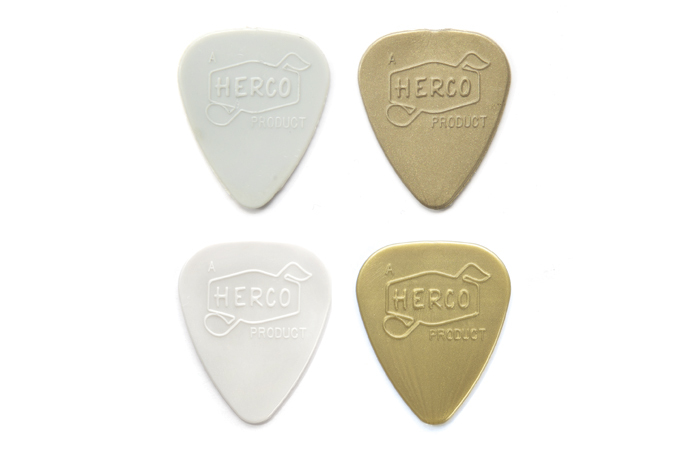 When guitar-driven rock ’n’ roll took over the music scene in the mid–1960s, the era’s trailblazers were equipped with Herco’s original nylon pick. By the end of the decade, nearly every guitar player was using them. Their smooth feel and warm sound appealed to the pros who were recording hit records and playing on the world’s biggest stages, while their widespread availability made it an easy choice for anyone wanting to learn to play rock guitar. 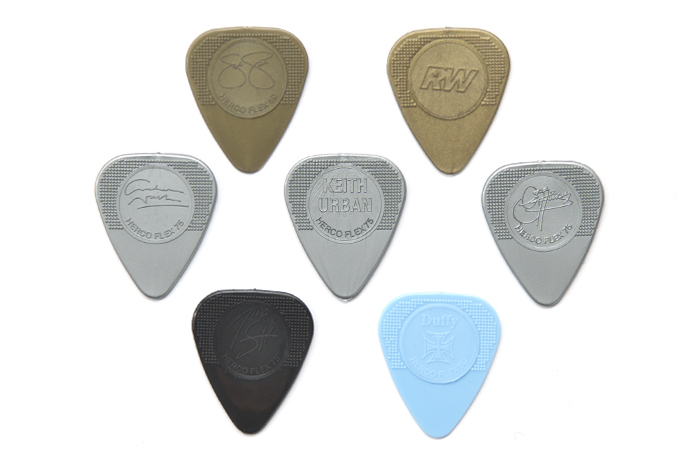 The list of greats who have used Herco picks over the years is extensive, and it includes Jimmy Page, Joe Walsh, Scott Gorham and Brian Robertson of Thin Lizzy, Pete Townsend, David Gilmour, Don Felder, Tommy Bolin, Rory Gallagher, and Gary Moore. The popularity of those picks endures today, with some artists—such as Keith Urban, Steve Jones, Gene Simmons, Billy Duffy, Troy Van Leeuwen, Don Felder, Eddie Van Halen, Wilco, Queens of the Stone Age, Nikki Sixx, and Madonna–having their own custom molds. Now, for the first time in years, the classic Herco nylon pick is available to guitar players once again in the form of the Vintage ’66 Series. To resurrect this iconic tool faithfully, we had to get right to the heart of what made the originals so great. How did we do it? 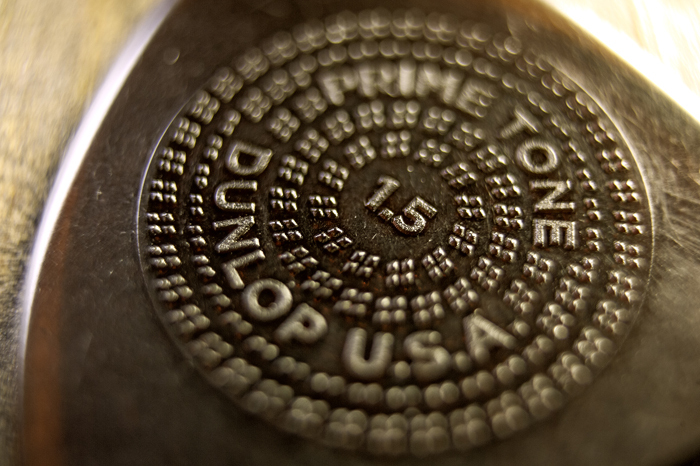 Dunlop pick guru Jimmy Dunlop gives us the details. What inspired you to bring back the original Herco pick? Jimmy: Last year, we discovered several pick molds had been stashed away in storage ever since we acquired Herco 20 years ago. When I realized they were the molds used to create the very first Herco nylon picks, I immediately knew that I wanted to recreate that classic pick magic. The problem was that the molds were just not in a condition to produce picks to modern standards. So how were you able to capture the spirit of those picks? Jimmy: Even though they were unusable, they gave us some very valuable insights into the design process. To fill in the gaps, we gathered up as many vintage Herco nylon picks as we could and played and studied them relentlessly. After that, we analyzed the pick material itself. Simply put, nylon is made differently today than it was 40 years ago, and that difference bears out in the sound and feel of a pick. We had to tweak a number of different parameters, but I worked with product manager Frank Aresti and the rest of my team to come up with a formula that perfectly captures the tone and feel of that old school nylon—it’s virtually indistinguishable. Through all this analysis and experimentation, we arrived at the Herco Vintage ’66 Series, and we couldn’t be happier. Even our pick experts were at a loss to tell them apart from the originals. How is the Vintage ’66 Series different from the Flex Series? Jimmy: There are two important differences between the Herco Flex Series and the Herco ’66 Series. The first has to do with grip: the Flex picks have a grip on both sides, while the Vintage ’66 picks have a grip on one side. Grips add stiffness to a pick, so you’ll notice that the Vintage ’66 picks are more flexible—just like the originals—than the Flex picks. The second important difference brings us back to the old nylon versus new nylon thing. Because the Vintage ’66 picks are designed with the characteristics of the older nylon style, they have warmer sound and a smoother attack than the Flex picks. Ultimately, the Vintage ’66 Series was created so that you can get everything you love about your vintage Herco nylon picks without having to take your collectibles out. What type of player should check out these picks? Jimmy: Plain and simple, if you want the classic warmth and smooth attack that you get from collectible vintage Herco picks, the same picks used by rock and roll giants to write music history, then the Herco Vintage ’66 Series is for you.